ReBuilder Medical is always pushing the envelope, and improving our products. We strive to make our products as effective & easy to use as possible. 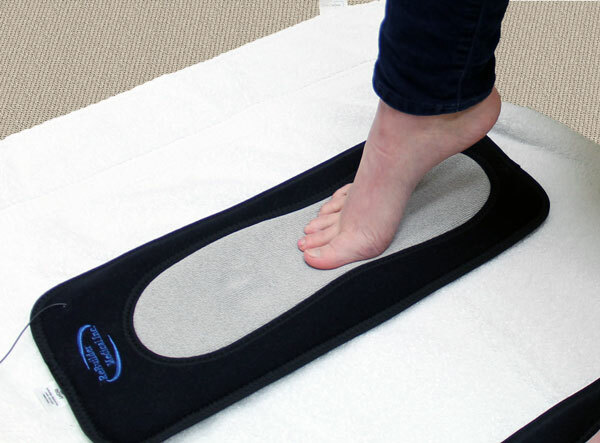 Our ReBuilder FootPads create a simple way for you to treat neuropathy of the feet (and more…). This is one of our most innovative proprietary products made uniquely for you. 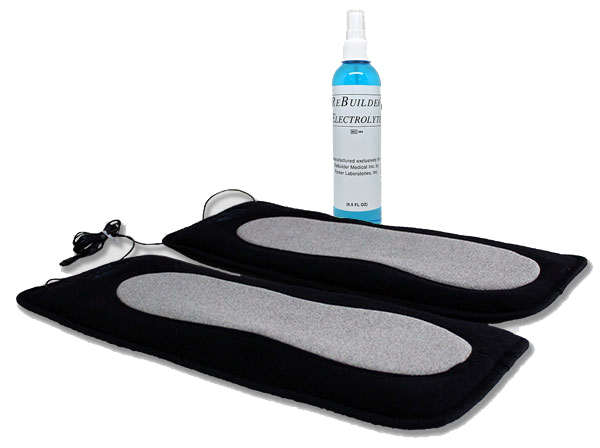 Simply spray the ReBuilder Electrolyte on the foot pads, plug in the lead wire to your ReBuilder unit ( sold separately ), sit down, place your feet on the foot pads and relax for 30 minutes. By using a conductive electrode which covers the entire plantar surface of the foot, the ReBuilder signal can be delivered with the utmost effectiveness. When the foot is applied flat to the electrode, the signal is received by all of the individual digits, while simultaneously stimulating the rest of the foot. Because the signal is dispersed over a large area, the signal intensity itself can be stronger when travelling from foot to foot, allowing for more effective treatment. Think of the comparison like walking on snow with or without snowshoes. Large surface area dispersion is much better than concentration into smaller contact patches. 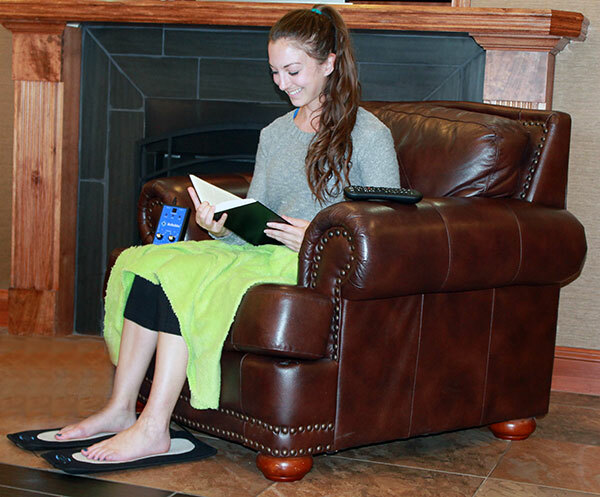 These new ReBuilder Foot Pads are easy and convenient to use. Just set the electrodes down on the floor and rest your feet on them. There is no wear and tear since you just rest your foot on top, giving them a very long, effective lifespan. They have a non-skid rubber backing to prevent any moisture on your floors. Care and cleaning is very easy. They can be stored flat or rolled up and secured with a small Velcro strap, to be stowed away in your ReBuilder carry case. 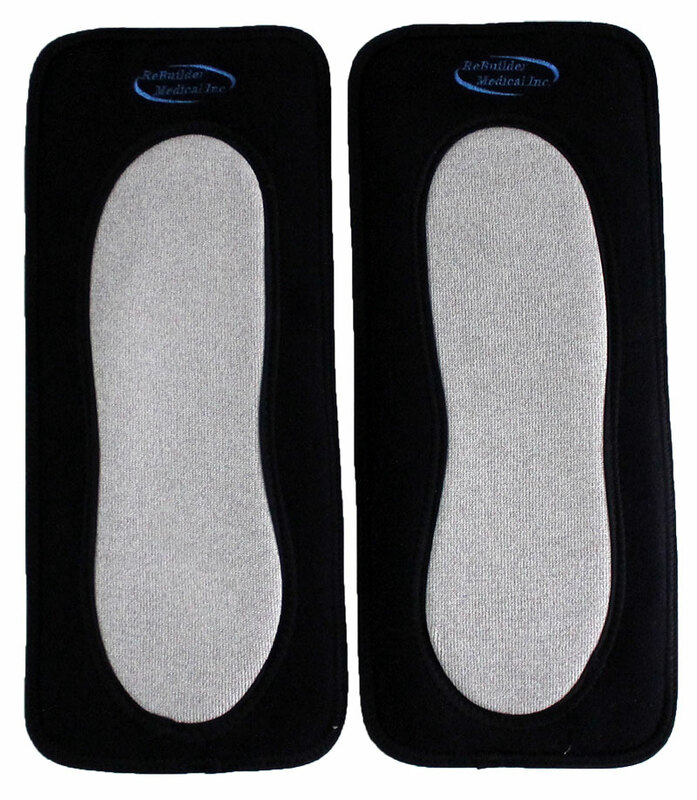 The ReBuilder Foot Pads are perfect for home or travel; practical yet effective. If you have significant issues focused in the toe area, rest only the front portion of the foot on the electrode, slightly elevating the leg with a pillow behind the knee will lift the heel above the conductive surface. 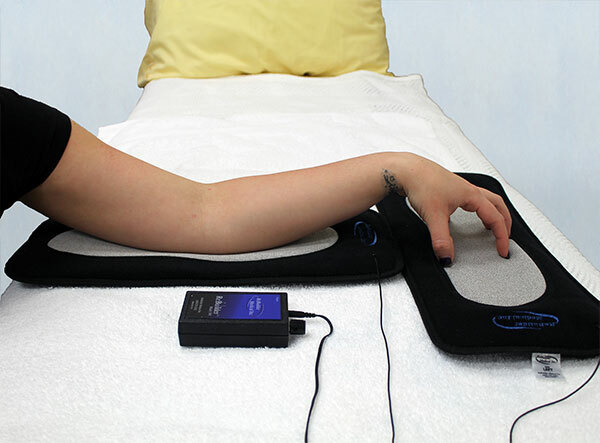 For hand treatment, place both hands flat on the electrodes while they rest on the table, or your lap. 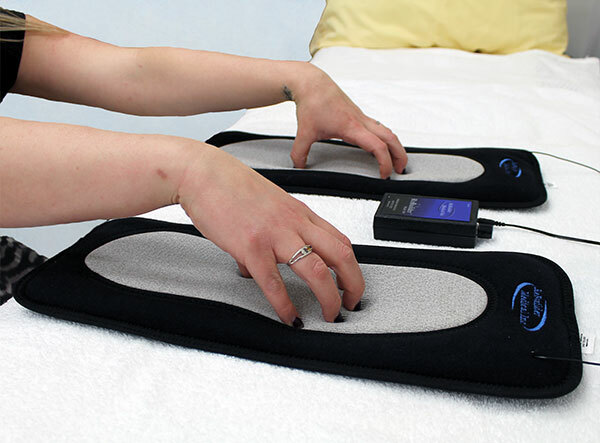 For hand treatment where the fingers are more affected, place the electrodes on your lap, resting just the tips of the fingers on the electrodes while the arm is supported by the armrest of a chair. For relief of discomfort associated with carpal tunnel syndrome, place one electrode under the fingertips and the other under the forearm. These ReBuilder Foot Pads are made from similar materials to the annular electrode straps for joint pain and the conductive garment socks or gloves. They can be hand washed in warm water and mild detergent (not Woolite) and hung to dry, or stood on their side in a dish rack. Do not machine wash or dry. These ReBuilder Foot Pads are designed to match the specific electrical parameters of the ReBuilder system, with all the quality and workmanship you have come to expect from ReBuilder brand products. They are covered by a 90 day warranty against defects. The electrodes come complete with electrolyte to enhance conductivity, and a leadwire ready to attach to your ReBuilder 300, 2406 or 2407. * This is a custom product, designed and tested by our engineering staff to work specifically with the ReBuilder system, and to provide long term worry-free service. At only $280 for the complete kit, they are a great value, with more diverse application methods. You will absolutely love the convenience of the new ReBuilder Foot Pads. We know that if we make using your ReBuilder easy, you are sure to do it, and that will bring excellent treatment outcomes. Order your ReBuilder Foot Pads today! * Does not include the ReBuilder unit. Unit sold separately. Some model 2405 ReBuilder devices may also work with this accessory. Early production models with the round leadwire will not, while later versions with the oval style leadwire plug will work. * ReBuilder stimulator sold separately. Copyright © 1987-2019 ReBuilder Medical Inc. All rights reserved.